This four-poster is magnificently situated in the Forestry Commission’s Allean Forest. It’s quite a steep walk from the car park to the circle itself, on forestry roads and grassy tracks, about 8.0km in length (4.0km each way). But it’s well worth the trek, as the circle sits on a hill cleared of trees, with fantastic views of the surrounding mountains, including Schiehallion. In fact the views are such that Coles wrote “Here site, scenery, megalithic remains, and surroundings all combine to render the investigation of this group memorable and especially interesting”. The circle sits on an artificial flat-topped mound, approximately 18.0m in diameter, and 0.6m in height. The platform has been covered, but some of the stones which make up a kerb around the base are visible on the S edge, protruding from the rough grass. The surrounding area has been cleared of it’s trees, leaving many stumps, but the circle and it’s platform have obviously escaped planting in the past. 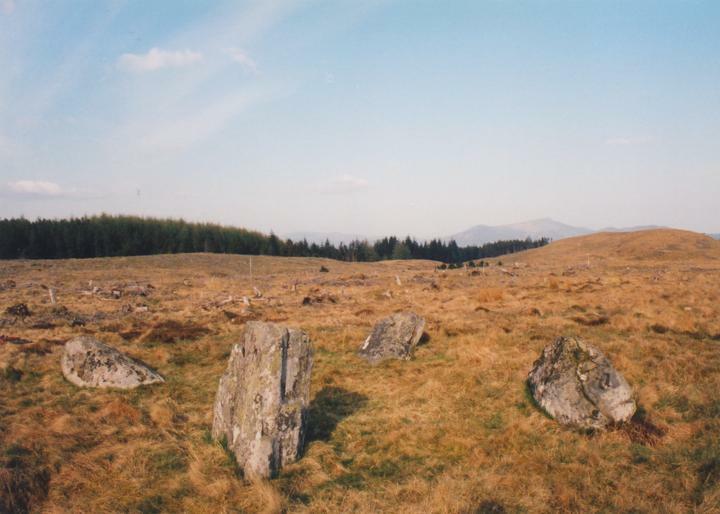 Of the four stones, only the SW stone is fully upright at a height of 1.2m, with the other three leaning at steep angles, but all four stones are of a similarly large girth and shape. The stones stand at the four corners of a square with sides of 3.0m, and rise in height to the tallest at the SW corner. At the centre of the circle is a small hollow that is apparently the result of some amateur archaeology, although whether anything was found is unknown. Where is Na Clachan Aoraidh? Na Clachan Aoraidh is in the parish of Blair Atholl and the county of Perthshire. Published on the 14th of May 2010 at 4:20 pm. Updated on the 11th of May 2015 at 1:52 pm.